When automatic valve control must be managed and controlled after the power is out. Where flow must be maintained or operated quickly and efficiently for safety. ProMation Engineering has two distinct lines of fail-safe solutions to protect lives and processes. With the use of either fail-safe line that ProMation Engineering offers, users can rest at ease knowing their processes or facilities are fully protected in the event of power outage. The PA Series quarter turn spring return actuators compress several internal springs in one direction and use the springs to drive in the opposite direction. While power is present, the actuator will respond to drive control signals depending on the method of control chosen. For an on/off, or 2 position, the motor will drive until it reaches its spring-loaded position and spring in the opposite direction with loss of power. For Proportional control, the unit responds to an analog control signal for positioning, whether to open or close (clockwise or counterclockwise). In both control options, when power is lost, the springs drive the actuator, either clockwise or counterclockwise, to its unsprung position. Torques from 445"lbs / 50Nm to 2300"lbs / 260Nm. 120/230VAC (On/Off or Proportional Control) or 24VAC/DC (On/Off only) supply voltages. Integral Manual Handwheel option available. (Factory installed option). Mechanical connections utilize an ISO5211 mounting with an 8 point female drive. The ProMation battery back-up units (PBU) can provide power to operate any electric actuator upon loss of power. The PBU's are designed to provide power to all ProMation actuators for a minimum of 5 cycles at full torque load. 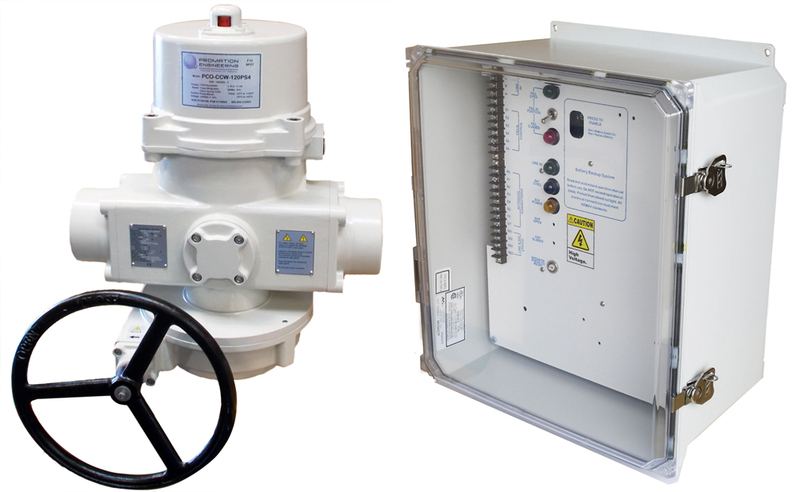 The PBU series utilizes proven battery systems and switching electronics that are compatible with all ProMation Engineering actuators. The separate local control station has field selectable fail-safe position, battery status and power indicators that can be used in conjunction with 2 position or proportionally controlled models.